Was your search query successful? Thank you for your feedback! Thank you. We are constantly trying to improve our search and your feedback will help us do that. Please let us know the details of what you were looking for. If you are not logged in and would like a response, please include your email address. 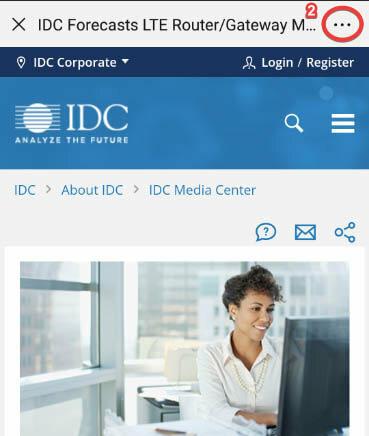 Provides complete background information on an IDC analyst. Each profile provides a biography, a notable quotation, a frequently asked question relevant to the particular analyst's focus, and a list of research authored by that analyst. Lists the analyst members of a topical team. Outlines general areas of coverage and any specialties. Provides rapid IDC insight and analysis about a significant industry event or conference, merger or acquisition, product announcement, or other fast-breaking news affecting the IT market. Provides a short, quick look at an updated forecast and the changed assumptions behind the update. It updates a market forecast published in the same calendar year, identifies changed and key forecast assumptions, and highlights actions for participants to consider in light of the changes. Provides coverage and analysis of an industry event, new product or service, or a company announcement or development. Provides brief overview coverage of what is happening in a market. Provides a concise, hard-hitting profile of an emerging vendor. A profile will highlight new players and technologies and the potential paradigm shifts or disruptions a vendor represents. Illustrates IDC's keen analysis of major market trends in downloadable PowerPoints. Available as a free download the day it appears, an IDC Daily Graphic provides valuable material for speeches and strategic planning. 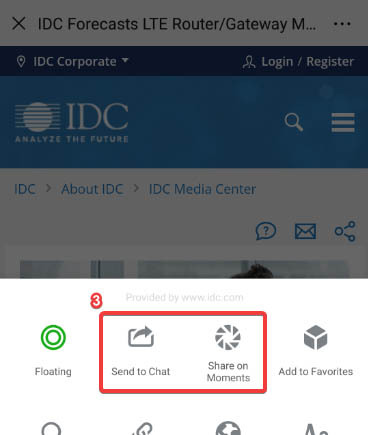 Provides published slides, audio, and other materials from IDC and Insights Web conferences, briefings, forums, or other events. Delivers dependable, relevant, and high-impact data and insight to help organizations make sound business and technology decisions. eBusiness executives, IT professionals, IT suppliers, and services suppliers benefit from the strategic insight and networking opportunities IDC conferences offer. Generally, all presentation slides are available online, and for most conferences, streaming audio of key discussions is available as well. Focuses on significant trends and paradigm shifts. Each Web conference will provide attendees with leading-edge market information that will enable them to make smart business decisions. For those unable to attend in person or those wishing to review the content presented, these synchronized multimedia presentations are available online. Serves as a framework for IT/tech professionals' IT strategy and planning for the next one to three years. It lists IDC's top 10 worldwide technology trends for the coming one to three years in a given research area and includes related drivers, projected IT/business strategy impact, and guidance. Helps IT/tech professionals develop a short list of suitable suppliers when selecting a vendor. Provides an unbiased assessment of tech suppliers in terms of offerings, strategy, capabilities, and other important factors in a given technology area. Describes five stages of "maturity" or capability for a particular technology area, helps IT/tech professionals understand where their organizations fit within those stages, and provides guidance on key components for planning successful improvements to a tech initiative. Helps IT/tech professionals to benchmark their maturity against peers, develop a business case for a tech initiative, and build consensus about where critical IT investments should be made. Presents quantitative research results that show the market distribution for a given tech initiative across the five stages of maturity presented in the related IDC MaturityScape. Shows the results and components of particularly successful initiatives. Gives IT/tech professionals insight into best practices (and practices to avoid) by providing specific use case examples implemented by peers. Identifies practices that have the most impact on the success of a tech or business initiative, and provides actionable guidance for each practice. Helps IT/tech professionals to justify and plan a business and/or technology investment or opportunity by exploring why, what, who, and how (these are also the main section headings). Presents key players, critical success factors, risks, and actions to consider for a designated technology and/or business management area. Helps IT/tech professionals with developing IT strategic plans and evaluating emerging technologies in terms of their risk to the business. Shows the adoption curve and risk levels over time for a specific emerging technology. Sorts technologies into three "adoption model" categories (transformational, incremental, opportunistic) to help tech leaders determine the potential impact for their organization. Correlates the use of specific practices and superior performance as indicated by an analysis of the benchmarking database. Highlights any significant differences between industries. Conclusions provide a set of process priorities for improving a business case and advice on how to overcome change management issues. Helps buyers to assess their business strategies and/or associated business processes, especially as they relate to the use of technology. Provides a step-by-step description of a method or methods that can be applied. As appropriate, the report may compare the benefits and drawbacks of several methods. Presents an article written by an Insights analyst on a topic of special interest to a target audience. This information has generally already appeared in an industry publication and is repackaged for display on the Insights Web site. Helps buyers select the right IT supplier. The report helps buyers understand the various providers of a technology by providing analysis on market landscape, vendor profiles, vendor market share, and vendor assessments. Presents an interactive spreadsheet tool for analyzing trends and activities in a specific market segment. These tables are available only through an annual subscription service. Provides bold, well-conceived market predictions grounded in solid methodologies, primary research, and analyst experience. Lays out a clear road map to understanding major market opportunities and trends. Provides the latest, select CIS forecast data, primary research survey findings, and critical IDC analyst opinion in a succinct, easy-to-digest PowerPoint format. Presents a hypothesis about what is happening in the market backed by the results of a demand-side or supply-side survey. The focus is on interpreting and analyzing the survey results and providing a strong point of view along with actionable advice. Answers a timely question and provides a strong opinion backed by IDC survey data. This is a quick nugget of information that is presented in two concise PowerPoint slides. Provides an easy-to-use format to post on the Web presentations that were previously delivered at public forums (such as conferences and events) or for internal client meetings and client presentations. It may not come as part of a consulting/custom engagement. Delivers a concise current state view of a market and insight into the impact of future trends. Business executives, product managers, and MI/AR professionals can use this information when looking to understand buyers' perspectives and market impacts. Announces significant corporate news, such as key hirings or promotions, performance milestones, event highlights, or speaking engagements. Describes a research product. Usually details the major areas of coverage and deliverables, and outlines key questions and competitive market conditions that the research will address. Includes links to all published research for a research product. Provides a detailed accounting and review of a vendor's programs, processes, products, service, satisfaction, and/or strategy in a target market. This knowledge helps clients reduce their risk of losing market share or enhance their position over the competition. Focuses on the important decisions that business and IT professionals make every day. Provides a detailed assessment of a specific target market's expansion pattern. This analysis helps clients develop and deploy the right mix of value-add products, programs, or services to support their sales and/or partnering efforts. Provides an in-depth examination of the dynamics and future of a single market or a group of related markets. The Market Analysis is where we will typically present our forecasts and assumptions, using a key forecast assumptions table. Provides the future of a single market or a group of related markets. It presents a new or updated market forecast, including key drivers and assumptions used in the forecast. Provides data on market size, regional allocations, and platform splits as well as a summary of vendor shares for the most recently completed period (year, quarter). Provides a onetime study produced by a research group that is not published as a deliverable under a subscription service. Provides a study and interpretation of the results of a demand- or supply-side survey. Highlights and emphasizes how IDC tracks the market while also making it easier for customers to find and identify IDC Taxonomy documents. Provides an analysis of the intricacies of an emerging or established technology or the technologies contained within a specific product. Provides an in-depth analysis of a company, a small group of companies, a division of a company focused on a particular market, or a best practice that the company exemplifies. 1. Scan this QR code in the WeChat app on your mobile device. 2. Click on the three dots icon in the WeChat web browser. 3. Pick the option that best suits your sharing needs.